This theme, to use the words of Lea Thompson, is also “beautifully written.” In my humble – but firm – opinion, Bob Gale's Oscar-nominated script is one of the best screenplays ever. It uses a powerful plot device in the form of a time-machine. Other than that, however, the story flows naturally from the given characters in the given setting. Once in 1955, it seems inevitable that Marty bumps into his dad. Once he has bumped into him, it seems inevitable that he rescues him. Once he has rescued him, it seems inevitable that her mother falls in love with him instead of his father. Once she has fallen in love with him, it is inevitable that Marty should try to put things right – which makes the rest of the story look inevitable again. A storyline flowing naturally from the characters in a given setting is one of the main criteria of a well-written drama. It also bestows upon the plot a unity of structure, another requirement of classical literary theory that Back to the Future meets perfectly. Due to its lucid composition, you can summarize the film's plot in a couple of sentences and you will never forget it once you have seen it. Finally, the film does not introduce anything into the story in the 1985 exposition that would not return or would not be alluded to during the main action in 1955. That is, every motif appearing on the screen has significance with regard to the movie's theme. It is a shame this script did not receive the Academy Award it was nominated for. Of course, the story has its contradictions. These contradictions stem from the fact that time travel is ultimately impossible. Despite its treatment by modern natural science – including Dr. Emmett Brown –, time is not a “fourth dimension” similar to length, width and breadth in which one could move freely. In contrast to spatial dimensions, time's main feature is its directedness: it flows in one direction, from the past towards the future. There is no way to turn it back. The paradoxical nature of the film's central plot element, however, only reinforces its main message: that one's life is shaped by events in the past one had no influence on and that one's own decisions in the present irreversibly shape one's own life and the life of others in the future. The movie is really about time in the sense St. Augustine, Henri Bergson and Oswald Spengler understood it. The outstanding aesthetic qualities of the first film become apparent when it is compared with the sequels. Part II and Part III are mere adventure movies with arbitrary plot devices, disorganized composition and insignificant motifs. To this latter category belong the technically advanced gadgets with which the imagined world of 2015 in Part II was adorned. Aesthetically insignificant motifs, however, can appear very significant from a practical point of view. As people are naturally interested in what the future holds, these gadgets – like flying cars – received more attention than the first film's genuinely creative ideas. Now that the real 2015 has arrived, it is all too natural that people are asking “where are those flying cars?” The answer to this question will teach us something more about the nature of time. In fact, those flying cars have been left behind in industrial society. Back to the Future II was made in 1989, just before the information revolution began in earnest. I mean this quite literally: the film was released in November 1989, in the same month that the first commercial internet service provider in the US served its first customer and in the same year that Tim Berners-Lee proposed the creation of the World Wide Web. In a sense, Back to the Future II was the last science fiction film produced in the industrial age. Its vision of the future was actually a projection of technical developments of this epoch: The industrial age brought us the car and the airplane; put these together and you will get the flying car. The industrial age brought us ready-made clothes and the hair-dryer; put together, you will get self-drying clothes. The industrial age brought us the phone and the TV set; put together, you will get the video-telephone. How could the film's authors have known that the age on which their predictions were based was soon coming to a close? That technical development would take a different direction, turning away from a further increase in motorization towards the electronic flow of information? That even their correct predictions, like the video call, would come true in the roundabout way of the internet – and that the roundabout would prove much more important than the invention itself? 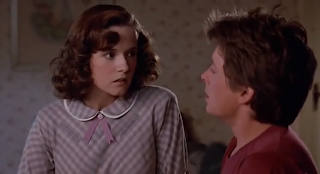 That Marty's kids, instead of wanting to drive a flying car, would be bent on checking their smart phones the whole day connecting with their online friends and collecting something called “likes”? In fact, the world of 1985 is much further from today's youth than the world of 1955 was from the 17-year-old Marty McFly. The authors of Back to the Future II were not the first to fall prey to the fallacy of imagining the future as a continuation of trends in the present. Karl Marx' prediction of a socialist revolution, for example, was also based on a projection of the economic developments of his own epoch into the future. What Marx saw around himself was an increasing number of industrial plants concentrated in the hands of the bourgeoisie and operated by a growing class of industrial workers. Instead of recognizing that history may bring new social formations in the future, Marx argued that industrial capitalism was the last exploitative socio-economic system. Due to the intensification of social antagonisms, industrial capitalism would be swept away by the revolution of the working class. Western European capitalism strayed from this track of development already in Marx' lifetime. By the second half of the 20th century it became increasingly obvious that industrial capitalism was not the last social formation preceding the apocalypse of socialist revolution. 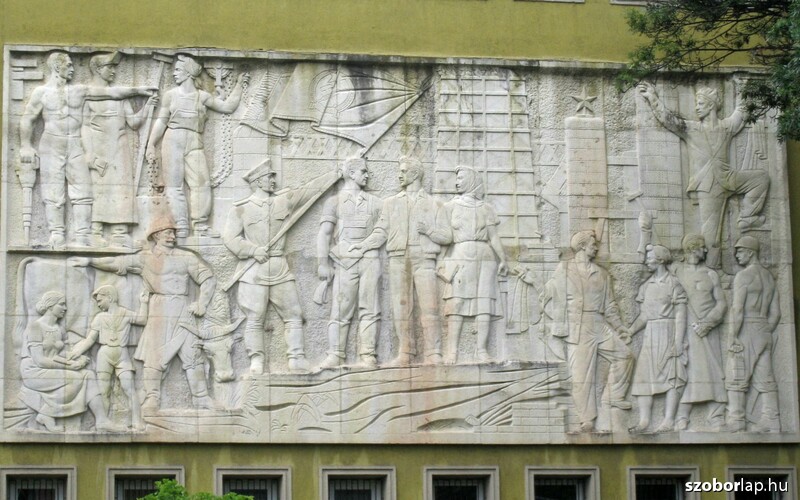 Instead, it was giving way to a “post-industrial” age described by many in terms like “service economy” and “information society.” Unfortunately, this development did not hinder Eastern European Marxists from staging socialist revolutions and from maintaining socialist systems in the name of the working class throughout the 20th century. These socialist systems retained Marxist ideology throughout their existence. Accordingly, the industrial worker was regarded as the driving force of the future up until their final collapse. 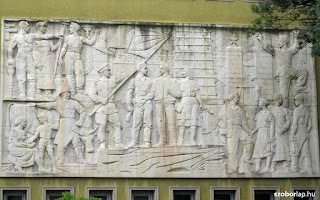 Hungary is still full of public buildings from the socialist era which are decorated with depictions of proud and stout factory workers building the brave new world of communism – with hammer and pincers. It is hard to believe now but, in the eyes of the builders, these decorations were supposed to represent the future. This vision of the future, like the flying cars in the film, was a projection of conditions of the industrial age to the world of tomorrow. The only difference was that the socialist vision was based on such an outdated interpretation of industrial society that it was no longer tenable after the information revolution gained momentum. The Berlin Wall, which had become a symbol of the socialist world system, was torn down in November 1989, in the exact month the first commercial internet service provider served its first client in the US. As we have seen, this was also the month Back to the Future II with its own fallacious predictions of the future was released. I am not arguing against trying to predict the future. As a good Spenglerian, I do think the future can be predicted to certain extent. My point is that, if you imagine the future as a continuation of present trends, you will always be wrong. Maybe you need a time-machine after all?